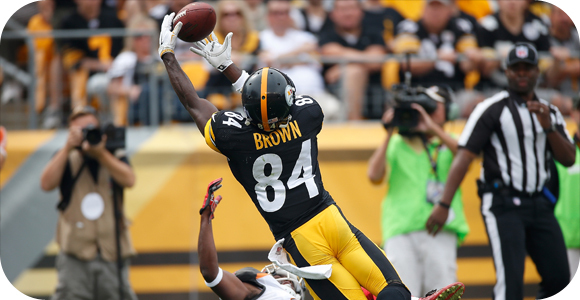 Sports bettors are gearing-up for the start of another NFL regular season and BetOnline continues to heighten the action with a number of NFL betting odds for a wide variety of team and player props. The following is a look at the player prop odds for which player will tally the most receiving yards in the 2015 regular season. The name at the top of the list is Pittsburgh wide receiver Antonio Brown. Bettors cash-in on his performance last season in this category when he led the NFL with 1,698 receiving yards on 129 receptions. His betting odds to claim this title again in 2015 have been set at +450. You already know that the Steelers love to move the ball through the air behind quarterback Ben Roethlisberger as the second-ranked passing team in the league last year. It is also pretty obvious that Brown is Big Ben’s top target so the value in his odds remains high. The second-favorite to lay claim to the 2015 receiving yards title is Atlanta’s Julio Jones at +550. Heading into his fifth season in the league, he has clearly established himself as another gunslinger’s top target with quarterback Matt Ryan pulling the trigger for the Falcons. Jones was third on the list last season with 1,593 yards on 104 receptions after an injury caused him to miss most of the 2013 regular season. With a huge contract extension in hand, he now has to really earn his keep so I like his value as well. If you are looking to bet on one of the fastest rising NFL stars in just their second season in the league, then take a closer look at Odell Beckham Jr’s betting odds of +750 to post the most receiving yards this season. In his rookie year with the New York Giants, he hooked-up with quarterback Eli Manning 91 times for 1,305 yards. The up-side to this number is that it was over the course of just 12 games. The one down-side this season is the return of wide receiver Victor Cruz to the Giants’ lineup after missing a good portion of last season due to injury. One of the top receivers in the league the past few seasons has been Denver’s Demaryius Thomas and his career has really flourished lately with future Hall of Famer Peyton Manning throwing him the ball. In the three seasons that this duo has been together, Thomas was fourth in the NFL in total receiving yards in both 2012 and 2013 and he jumped to second last season with 1,619 yards on 111 receptions. As long as Manning remains under center with the Broncos, Thomas is in line to be his go-to guy adding some solid value to his +800 odds to claim this year’s receiving yards crown. Rounding-out my Top 5 players to earn the receiving title in the 2015 regular season is Dez Bryant at +900 betting odds. Last season he caught 88 balls for 1,320 yards to finish eighth on the list and that was with Dallas relying heavily on DeMarco Murray and the running game to help take pressure off of veteran quarterback Tony Romo. Murray signed with Philadelphia this offseason as a free agent so there is a good chance that Romo will once again be looking to Bryant to help fill the void with a heavier reliance on the passing game. Bryant’s best season in his five-year career with the Cowboys was in 2012 when he gained 1,382 receiving yards on 92 catches. He finish that season ranked sixth of the list.